Hip replacement surgery involves removing the damaged hip joint and replacing it with a new artificial joint. One popular option is a metal-on-metal (MoM) hip replacement device where a metal femoral head (the ball) and a metal acetabular cup (the socket) replace the natural bone ball-and-socket joint. Unfortunately, these MoM implants have a much higher risk of serious complications than other types of hip devices, such as stem and neck fractures. Some MoM devices are failing due to stem and neck fractures. The stem, inserted into the femur, anchors the hip implant in place. A stem fracture occurs when this piece breaks in two. This type of fracture happens most often with modular devices, but can also happen with a one-piece design. Modularity — where the stem and neck are two pieces — allows surgeons to fit the implant more specifically to the patient; however, it increases the number of mechanical junctions that may lead to fretting, corrosion, and fracture. These fractures usually happen over time. What may start as a microscopic crack in the modular neck grows until only a small piece of metal holds the neck together. Breaking of the stem and neck are serious failures for some of these devices. These fractures typically happen without any warning, requiring emergency surgery to remove and replace the broken device. This can be an extremely invasive, complicated, and expensive procedure with a long and painful recovery. Research shows that certain MoM brands are failing at a much higher rate than others, including Stryker and Wright Conserve. According to Stryker Orthopaedics, there is a potential for fretting and corrosion where the modular parts come together. For Stryker, the problem is that the junction where the stem and neck meet is made of two different metals (titanium and cobalt chromium). These metals can undergo an unusual reaction that can cause extreme wear and corrosion. Of major concern with the Wright Medical Profemur hip implant is the modular neck, which connects the ball with the stem. The neck’s flexibility makes it too easy to bend, fracture, and break. When the neck fractures, often the entire stem will need to be removed from the bone, which can be a difficult process. 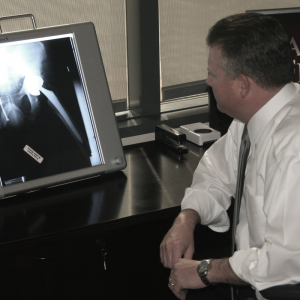 Any metal-on-metal hip replacement can become a medical problem to a patient who has a severe reaction; however, the neck of a modern hip replacement stem should not break. Contact us for a free, no-obligation evaluation of your case.